Expect to see millions of web devices, even desktop web devices, in the coming years that completely strip out the Windows layer and use the browser as the only operating system the user needs. That was going to happen anyway, but Chrome + Gears just made the decision a whole lot easier for hardware manufacturers to make. 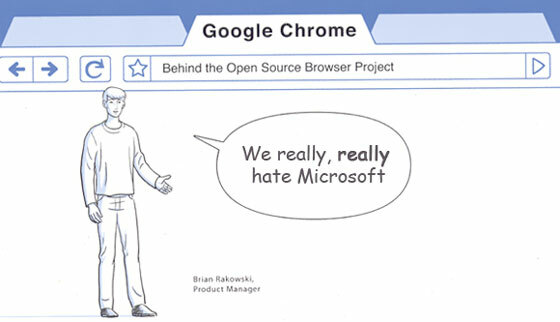 Microsoft, meanwhile, is stuck with a bloated closed source browser that they don’t even tether to their search engine for fear of more antitrust woes. Google can push their search engine and other web services all day long on Chrome, with no government interference. So not only will Chrome drive lots of incremental revenue to Google, it also paves the way for a Microsoft-free computing experience. I love Chrome already and I haven’t even tried it yet (nor will I be using it much soon, since it will only work on Windows for now). But Google’s days of unchecked growth may soon come to an end. They are quickly becoming the new Microsoft.